probably know by now I"m getting to be quite a fan of CSN online shopping. purchased and the speed in which they get them to me. for that fabulous bargain to get here! 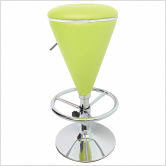 the activity I found these adjustable bar stools. perfect!! I love the modern lines too!! yes... you know why? Because it reminds me of a Margarita that's why!!!! now, hop on over there and check them out, tell them I sent you! What do you do on a day off???? Have you met my kids... Chalk and Cheese? Five things I've learned this week!!!! !